Daniel Alfredsson, who became the most recent NHLPA member to record a significant personal achievement, isn't done when it comes to netting more milestone moments. Sitting just three points away from 1,000, Alfredsson, one of the most prolific Swedes to ever play in the NHL, entered Ottawa's recent key divisional game against the Buffalo Sabres on a mission of sorts. With the Senators mired in an early season funk, the 37-year-old captain, who skated in his first NHL campaign in 1995-96, was hoping to provide a spark for a club in desperate need of one. Alfredsson responded in typical fashion, notching a hat trick in a 4-2 win over the Sabres, a performance that enabled him to become just the 75th player in NHL history to reach the four-digit mark in points. While he can point to any number of people – players, peers and teammates – that have had significant influence on his hockey life, Alfredsson acknowledges his mother as a major role model. Recognized as one of the league's top two-way players, Alfredsson holds the Senators' franchise records for goals, assists, points and games played. Not bad for a player who didn't receive much fanfare prior to making his NHL debut 15 years ago. Alfredsson, who recorded 26 goals and 61 points in his first big-league campaign, was awarded the Calder Memorial Trophy as rookie of the year and was the Senators' representative at the NHL All-Star Game. In 1996–97, he improved on his rookie totals and played in the All-Star Game once again. He finished second in team scoring, helping Ottawa net their first modern playoff spot. The right-winger has four 30-plus goal seasons to his name, twice reaching the 40-goal mark, including a career-best 42 tallies and 103 points in 2005-06. On July 8, 2009, Alfredsson became the longest serving active captain in the NHL, as former Montreal Canadiens captain Saku Koivu signed with the Anaheim Ducks and former Colorado Avalanche captain Joe Sakic announced his retirement. On April 6, Alfredsson reached another NHLPA-recognized milestone, appearing in his 1,000th regular season game, all with Ottawa. That's not likely to stop any time soon. For Alfredsson, who holds the Senators record for highest plus/minus rating in a season, set in 2006–07 with plus-42, along with the team record for most points in a regular season game, set in 2007–08 with three goals, four assists and seven points, doing his part to help Ottawa keep pace in the contentious Eastern Conference remains his single focus. That's never been an issue for one of the game's steadiest stars, a player who has enjoyed success on the international hockey scene as well, highlighted by Sweden's gold medal-winning performance at the 2006 Olympic Winter Games in Turin, Italy. And he's not quite done in terms of adding another NHLPA milestone to his resume. 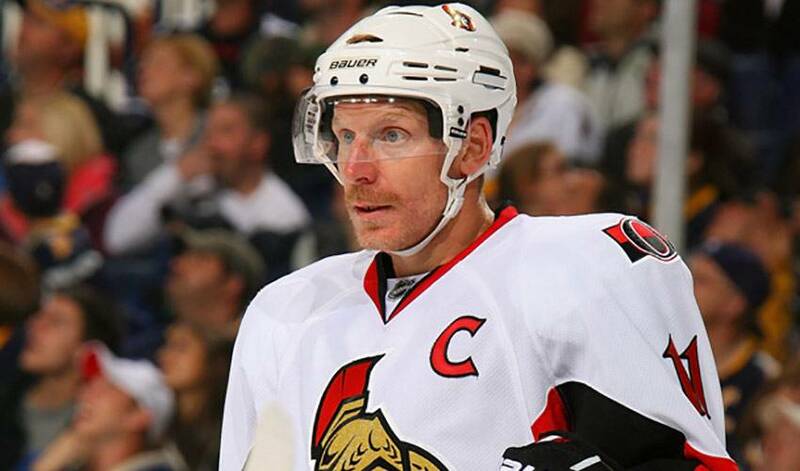 Alfredsson finds himself just over 20 goals away from 400 for his career, a mark well within his reach in 2010-11. You can bet his mother, Margarita, among many, can't wait for it to happen. The legacy of the Swedish, former Ottawa Senators captain affectionately known as Alfie, is forever undeniable as his name hangs from the rafters at Canadian Tire Centre, but it continues off the ice.